As of the 2013 release, you can now set up your license server and Softimage workstations so that idle licenses are reclaimed by the license server and distributed to other machines. An instance of Softimage (xsi.exe) is considered idle when there is no mouse or keyboard interaction, no command or script running, and no active progress bar. Softimage is never idle in batch mode. 2013 includes a new Licensing check interval preference (Preferences > General). Basically, this “check interval” is how long Softimage can be idle before it will give up its license. By default, the Licensing check interval is 1 minute. That means that if Softimage is idle for a minute, then the license server could reclaim the license and give it to some other user. To disable the license time-out feature, set the check interval preference to 0. By default, the license server does not reclaim licenses when Softimage is idle. To configure the license server to reclaim idle licenses, you need to set the TIMEOUT option. To do that, create a plain text file named adskflex.opt in the same folder where your license file is located. You will need to restart the server to read the changes to the options file. With the TIMEOUT option set on the license server, the next time your Softimage is idle for longer than the check interval, the license server may reclaim the license to give to another user. 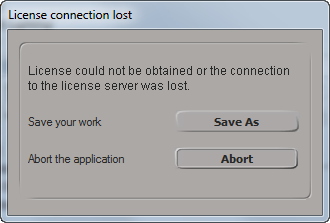 When you start working actively with Softimage again, it will try to check out another license from the server. If it gets a license, you’ll keep working and you’ll never know your license had been “lost” while idle.